As if Colombia doesn’t have enough magnificently diverse landscape it went and smashed a desert in between its rainforest and high mountains. While in some ways it resembles a miniature model version of Arizona it’s certainly no Grand Canyon but Tatocoa’s size makes it easy to visit and explore. 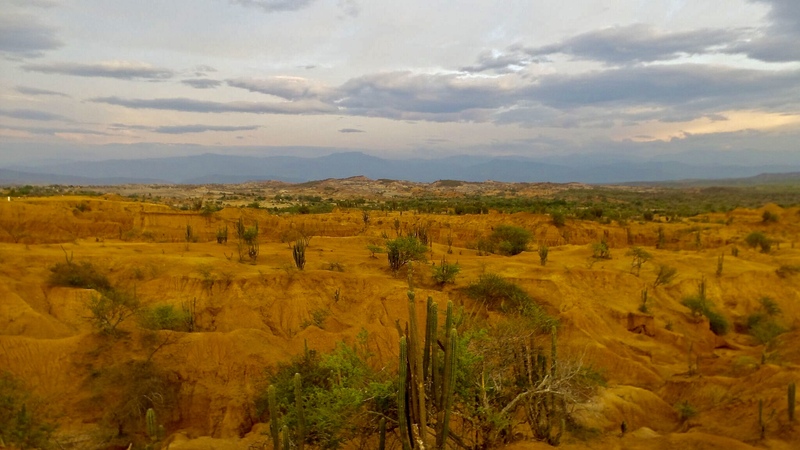 With Colombia’s desert being so easily accessible it’s a popular place for weekend parties and holiday celebrations. Plenty of accommodation options and camping spots line the main strip. Glamping thrives in Tatacoa and like a pot of gold at the end of a rainbow, there’s even a pool at the end of a trail complete with a stand for a snack and refreshments. It’s no mirage just smart business in hot, dry conditions. Even within its small confines the landscape of the desert abruptly changes from melted, golden-layered sand castles to patient, waiting ghosts, still and gray. Sporadic thin green patches thicken towards the mountainous horizon but wildlife mostly stays quiet with the occasional hawk swooping by, carefully perching on heavily thorned cacti. Just another amazing corner of Colombia to enjoy. A land of endless blatant beauty.